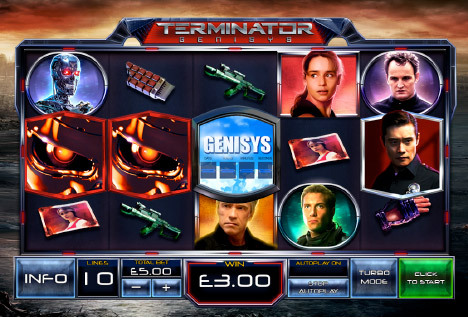 Terminator Genisys is now playing at Fly Casino! This incredible 5-reel, 25-line is based on the 2015 hit movie! Fight along with the Terminator, Sarah and Kyle to escape the T-1000 as you play for the two bonus features while all along enjoying stacked symbols, wilds and multiplier wilds. The Terminator Car Chase Bonus feature this is triggered randomly during any spin of the game at any bet level. Your goal is to shoot as many T-1000’s as they appear on the reels. Each T-1000 shot will award you a cash prize of up to 10X your bet, a win multiplier of up to 5X or a re-spin symbol. FREE SPIN BONUSES – TWO OF THEM! Get 3 Genisys countdown scatter symbols simultaneously on reels 1, 3 and 5 and you will trigger a choice of two free spin bonus features. Gets you 10 free spins. Look at the rusty barrels that sits on top of each reel. When a T-1000 wild lands on a reel under a barrel, The Terminator shoots the barrel turning it into a Gold Multiplier wild. This only happens with each Gold Multiplier wild giving you a multiplier of 2X, 3X or 5X. These wilds lock in place until you win! In addition, the Terminator wilds will stack to give you even bigger payouts. Also gets you 10 free spins –On any free spin during the bonus round, the figures displayed on side of the reels may shoot various projected images. The will result into a Stacked Genisys wild filling the entire reel. These will also lock into place until you win! Terminator Genisys is an action packed game offering you lots of ways to win and be entertained. 144% Up to $144.00! From 00:00GMT until 23:59 GMT, all members on their deposit of $/£/€50 or more will receive a 144% bonus up to $/£/€144.00.